2) it creates agents who have had more transactions and, therefore, more experience which enables them to better serve buyers and sellers. 4) it creates a more manageable workload for agents. 5) brand consistency is better controlled when one person (the broker) is in charge of all advertising and marketing. 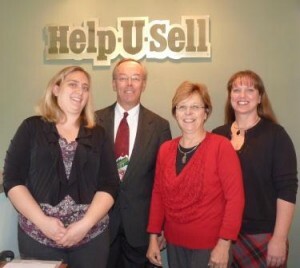 The entire staff of one of our most successful offices, Help-U-Sell Direct Savings Real Estate in Waynesboro, Va. Most importantly for us, however, a broker-centric model enables our offices to offer consumers choices, ultimately saving the consumer money compared to the old-fashioned agent model. That model, while slowly fading away, seems to exist only to support the inefficiencies of that old business model. If you would like to learn more about our business model, we invite you to visit our Franchise Opportunity Center website. We also encourage you to read the two articles, if you haven’t already, and leave your comments as to how the broker-centric business model works for you.